I admit that when I first saw the commercials for the new Hershey’s Drops, I was extremely skeptical. Why would Hershey’s try to copy M&M’s? I couldn’t even wrap my mind around the outrageousness of the idea enough to compose further questions. Then, when I saw the bags of milk chocolate Drops on display at Walmart, I was interested to see that the tagline read, “No candy shell — no mess.” Isn’t that how M&M’s were marketed when they first came out? [Melts in your mouth, not in your hands…] And now Hershey’s is using that against Mars, Inc. In any case, I scoffed and went on my way. 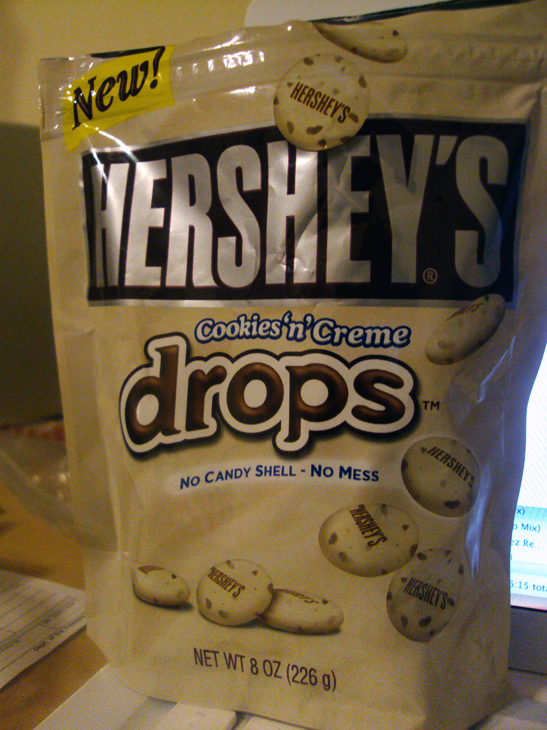 The second time, however, I had already been tempted twice by Hershey’s Cookies ‘n’ Creme chocolate bars by the time I came upon the Drops version, so I simply had to taste and review them — for the sake of enterprising journalism, of course. Hershey’s Drops are big, about the size of quarters, and have a thin clear coating that seems to prevent the chocolate from melting. It was cold when DP and I tore into them in the parking lot, so we didn’t really have a chance to test the heat resistance of the coating. The chocolate tastes just like a regular Cookies ‘n’ Creme bar, and the coating dissolves quickly and tastelessly. The Drops make the chocolate easy to share, but portion control is a disaster. DP and I ate half the bag after our midnight Walmart run and finished the rest on the way to church the next morning. 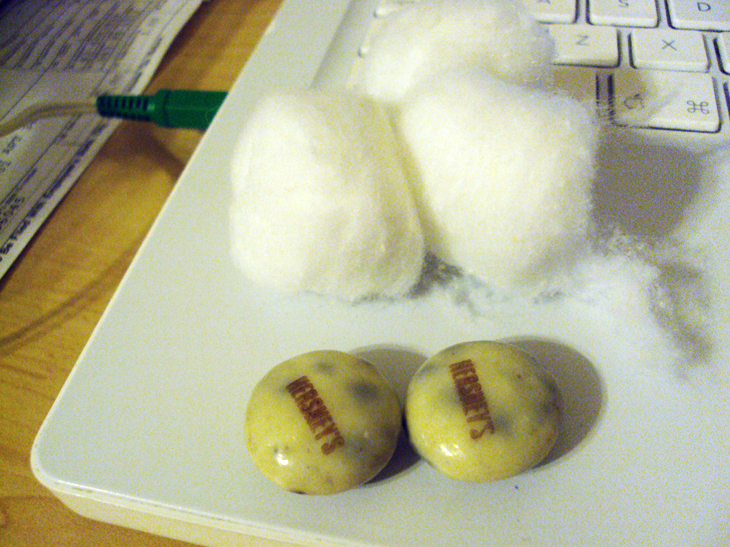 I like to eat cotton balls with my chocolate. Don't you? You are currently reading Valentine’s Day Chocolate Fix: Hershey’s Drops at auradis.